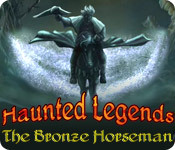 Haunted Legends: The Bronze Horseman is rated 3.8 out of 5 by 66. Rated 5 out of 5 by klt03301 from One of my favorites! I thoroughly enjoyed playing this game! Beautiful graphics, plenty of hidden object scenes (I prefer those to the puzzles), and the puzzles weren't too challenging. The only negative thing I could write is that the ending was kind of a let down. Still a fabulous game and I felt I got more than my money's worth! Rated 5 out of 5 by tilmalene from Entertaining A relaxing fine game, good storyline and grafc. Rated 5 out of 5 by JulieJay from Haunted Legends: The Bronze Horseman I thoroughly enjoyed this game and for me it had just the right amount of everything in it, HO's, puzzles. Yes you had to backtrack a few times but not so much as to be irritating. The only disappointment was the too easy final puzzle and abrupt ending. Rated 5 out of 5 by DrDavid from I really enjoyed this one. This game has no help except during the HOS screens. So I found myself challenged to figure out what was wrong when I got stuck. And I got stuck a lot and always figured it out. Sometimes I skip the puzzles in HOS games because through rote process a monkey could finally get them right, but these puzzles held my interest. The HOS were mainly not too dark and this was the first game where a few of the objects were so blatantly drawn in the foreground. One or two always seemed to be right out there where they were obvious. That made it really embarrassing to have to use a help clue to find it; sitting out in front. There were a few errors, like the toad was really a frog, and the sneakers were really slippers, but just a couple. Rated 5 out of 5 by subo2 from Haunted Legends: The Bronze Horseman Excellent game with a lot of scampering back and forth to different scenes! HO scenes were quite challenging! The ending was surprisingly disappointing. Rated 5 out of 5 by meanymouse from Loved this game I have purchased many games and I am always looking for games I have not done, because I only purchase from Big Fish, and this game was fun, with a great story line. I played it on expert mode and it was challenging. The graphics, music, and storyline are great. 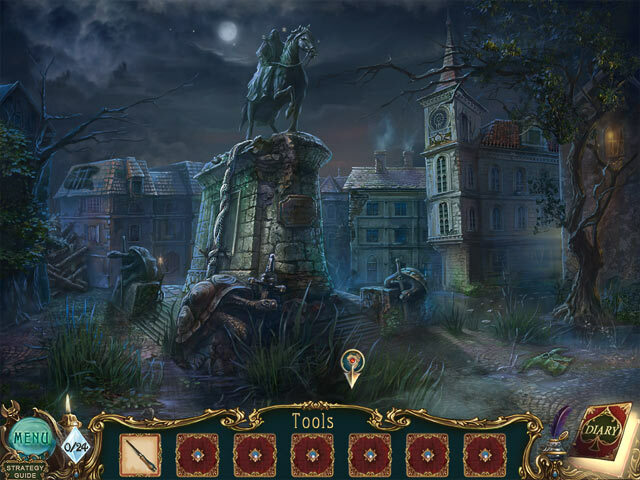 For those who loved the Mystery Case games you will like Haunted Legends;The Bronze Horseman also. Rated 5 out of 5 by agbosche from Quality Game Great Graphics I like games that don't require a brain surgeon's knowledge to play. The puzzles are fun and not overly hard. The storyline was also pleasing. I recommend this game. Rated 4 out of 5 by ninda2 from One minus I really enjoyed playing this game, the one downfall is there was no map. I enjoy having those although you really don't need one to maneuver around, it is a pretty simple game and it isn't one of those dark sinister games. Rated 4 out of 5 by rosekaufmann from GALLOPING AWAY SUMMARY: Game took me a little over 4 hours to play. Because there is no hint system outside of the HOS, this can be a very challenging game to play. You have only your diary and trial and error to figure out where to go and what to do. Note that you have to collect all 24 crystals of souls (skulls in colored crystal enclosures) in order to end the game). Lots of adventure. GOOD: HOS – plenty of them; in fact, the majority of the game seems HOS-oriented. List based; some were a little challenging to find because of the color palette used and there were a few shadowy areas (where of course there were objects hidden). PUZZLES – plenty of them. Some were quite challenging. Instructions were not always as detailed as they could be, so you would spend time doing a trial and error before finally getting it (then you either feel smart for getting it or dumb for not getting it immediately). OKAY: Graphics – a bit murky around the edges in the locations and the HOS. Since this is an ERS game, it was probably intended to be so. Music - too much oboe – music became a little intrusive (especially during HOS), but not enough to silence it. NOT SO GOOD: No map – would have helped to have a map when more locations opened up so you wouldn’t have to wonder “now, where did I need this object?” Once a new area is opened, most of your location work will be in or near that location, but you will still be doing some traveling to distant parts. Hint system – good in the HOS, but no hints on where to go or what to do outside of HOS. Have to find all similar inventory items before you can use them (ex: 4 pieces of a lock require that all 4 pieces be found before using; you cannot place only the one or two you’ve found already). Rated 4 out of 5 by coolang1989 from GOOD GAME I enjoyed this game. I liked the dialogue, HO scenes, and the adventure part of this game. Although this is a pretty short game I did not need a stragedy guide to get through it. I did read the game walkthrough on the forum a couple of times and parts were not really easy to figure out. I found the mayor's son in about 6 hours. Rated 4 out of 5 by RevKellie from Early entry for HL - good basics Plus: good story, recurring character, items all match motif, neat mechanical background and sounds. Scenes lead smoothly one to another (a few back and forth but you don't need a map). Minus: No Hint unless in a puzzle, Dim shadows - many of the HOS are on the dim side and dense - making things hard to see, humorless, repetitive HOS scenes (you find countless door handles). Abrupt, nonsensical end. I played other Haunted Legends before this first one, so it was like a step back. Story is interesting - although the end is abrupt and not explanatory in any way. Perhaps the collectors edition end is more satisfying. I do like chasing S.G. through the haunted legends games. He's a fun villain. Puzzle challenge low to med. Didn't need to skip any. Rated 4 out of 5 by shihtzumum from Really liked this game Another very good Haunted Legions series. It has tons of HO games and they were semi-challenging. Did not care for a lot of the mini games, but can't have everything. The length was very good and on the longer side. Well worth playing so give it a try. The one complaint I do have is that if I got stuck, there were no hints offered and I had to go to the game walktru. Hope they make more in this series, but add hints please. Rated 4 out of 5 by Thecountess11 from Good game with an extremely disappointing end I was thrilled over the story of this game up until the end; which was the biggest anticlimax ever... Nonetheless, I enjoyed it as the graphics were wonderful, and I really liked the idea of the crystals. Rated 4 out of 5 by Pittsburgher1000 from Very enjoyable game; nothing new I enjoyed playing this game. It is very similar in set up to Haunted Legends: Queen of Spades. If you liked that game, you will like this one as well. The game was challenging enough to keep me interested, but did not require the use of many hints. The storyline was fun; however, I have to agree with another reviewer who was disappointed in the ending. I expected a little more. Do not let that discourage you, though; it is an entertaining game. Rated 4 out of 5 by Rudygeegee from Beautiful Game What a beautiful game! Graphics are crisp and well defined. Descriptions match objects in HOS. Puzzles are about average, not too hard. Nice storyline. Might be a nice SE game for me. Hoping for a little bit more of a challenge - I played on the expert level. But overall, a nice solid game. Rated 4 out of 5 by eponym from This was fun. I thought the game was moderately challenging. There were a few times where I thought this was easy until I realized I must have missed something and needed to retrace my steps. I enjoyed this. Rated 4 out of 5 by arolsma from Good story line enjoyed this game. some puzzles were harder than others. Rated 4 out of 5 by Clozar from ENDING WAS THE WORST EVER! I enjoyed this game. The HO's were not to difficult but enough of a challenge that you really had to search for some items. Which makes it more fun. The storyline was good. I own the Haunted legends: Queen of Spades which i found more fun than this one. This one was shorter which was a disappointment and the ending was just terrible. One minute you are doing a puzzle and the next sec you are getting the credits. What is up with that. But all in all it is a good game. Rated 4 out of 5 by Yahsana from Haunted Legends: The Bronze Horseman I loved it.......the music really creeped me out. The Graphics were terrific. 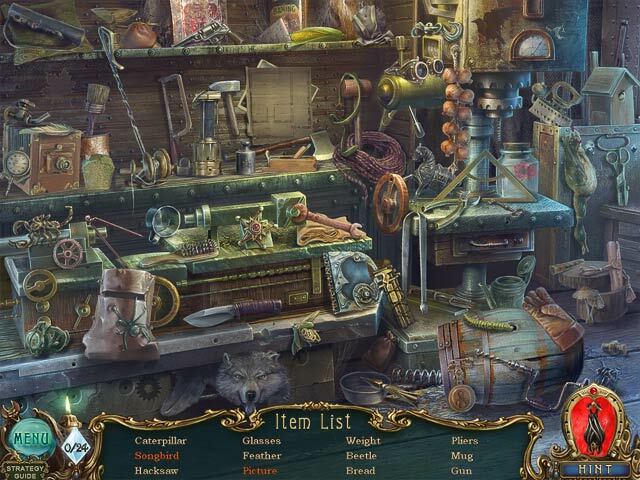 Rated 4 out of 5 by Thommy53 from Well-thought-out Hidden Object Adventure The performance of this game is very captivating and brings many hours of fun. The only annoying thing about this game is the music - the same acute discords throuhout the whole game. Anyhow I recommend this game because of its challenge qualities. Rated 4 out of 5 by zoomzoomZombie from Nice Sequel! 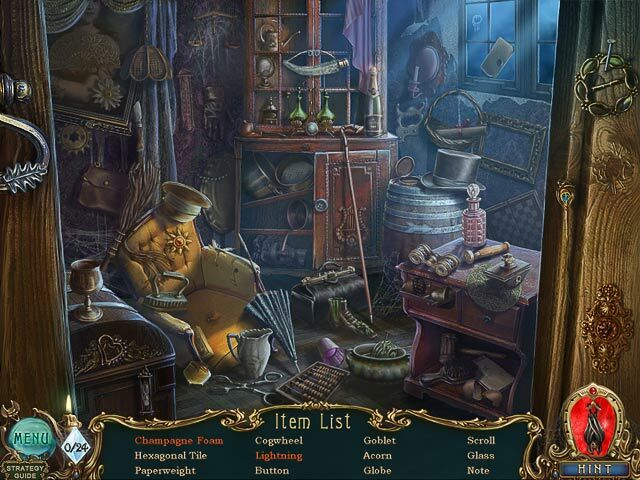 Haunted Legends: The Bronze Horseman is a hidden object adventure game. The plot has you playing the detective sent in to save the mayor's son from the evil little man who has been kidnapping souls. I was really looking forward to this game because I liked the first one in the series. The game was a lot of fun, but the puzzles were on the easy side. The length was very nice, longer than some similar games. The music was annoying. The voice acting was nice, except for the character of the little girl. She was annoying, too. The graphics are beautifully drawn. As some other reviewers have commented, the ending is really abrupt. I played in expert mode and it took me over four hours, playing leisurely. Rated 4 out of 5 by Melvin2 from Fun game! I really enjoyed this game! The HO sections were not too hard, but some of the puzzles required some thought. And there wasn't a lot of running around just for the heck of it. Many solutions were within a scene or two. What I did NOT like was the ending -- very abrupt with no wrap-up! Disappointing. If it had had a better ending, I would have given it 5 stars. Rated 4 out of 5 by RioMom from Great game! I think this is a great game! It has a nice balance of HO puzzles and strategy puzzles. (I read someone thought there were too many HO puzzles, I have to disagree.) The graphics are really good and the story line is fun. It's challenging without being too difficult.